As I noted earlier today, the Washington Post’s Capital Weather Gang have reported that last year is the first on record to have no EF-4 and EF-5 tornadoes in the US. The Capital Weather Gang long ago sold their souls to the global warming religion, and are usually very loathe to admit that sometimes the weather might be better because of a bit of warming. In fact the study they refer to is hopelessly flawed, as I proved at the time. The impact of climate change on tornadoes is still an active topic of study. Early research suggests that the warming earth will provide more energy to produce the storms that generate tornadoes, but less shear to give the necessary spin. Observations over the past few decades have yielded a couple of interesting trends. While there are now fewer days with tornadoes in a given year, there are more tornadoes on the days when they do occur. 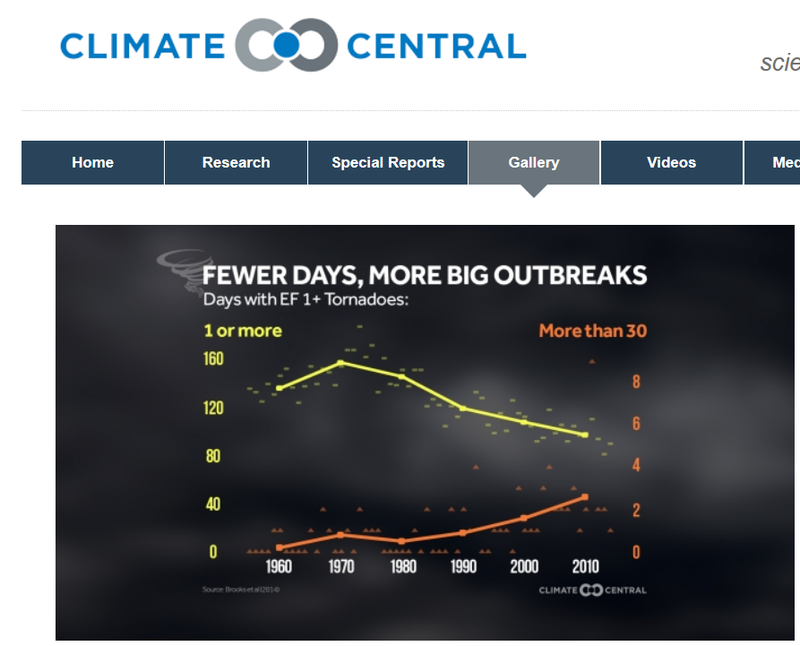 A 2014 NOAA study examined trends in the tornado record for a possible climate change signal. 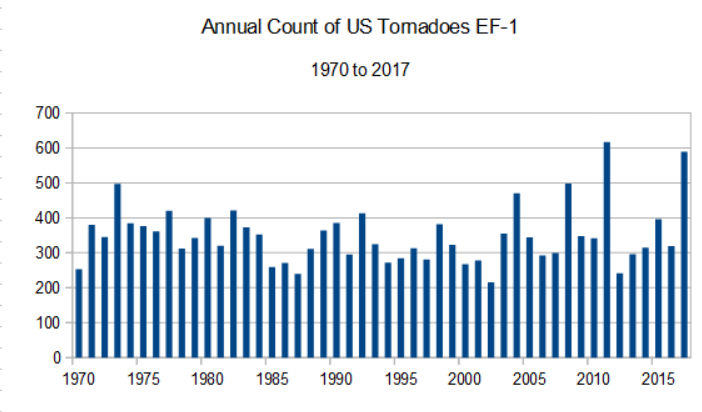 Since the early 1970s, the nationwide average annual number of days with at least one (E)F1 or stronger tornado has dropped from 150 to 100. Yet, there has been an increase in the number of days with a very high number of tornadoes. In the 1970s, the average number of days with more than 30 (E)F1 or stronger tornadoes was less than one. In the last decade, that number had jumped to 3. Only two years in the record had more than 750 (E)F1+ tornadoes – 1973 and 2011. But even during the active year of 1973, only 2 of those days had more than 30 tornadoes that rated (E)F1 or stronger. In 2011, that number ballooned to 9. Further, 2011 had as many days with more than 30 (E)F1+ tornadoes than the entire period between 1961 and 1981. What the study did not reveal was the fact that many more of the weaker EF-1 tornadoes are now reported than in the past, because of changes in reporting practice, such as Doppler radar, storm chasers, cell phones and the rest. It is well accepted that the historical numbers of the weakest EF-0 tornadoes should be ignored for this reason. For more detail, check out my post here. Tornado reports have increased, especially around the installation of the NEXRAD Doppler radar system in the mid 1990s. This doesn’t mean that actual tornado occurrence has gone up, however. The increase in tornado numbers is almost entirely in weak (EF0-EF1) events that are being reported far more often today due to a combination of better detection, greater media coverage, aggressive warning verification efforts, storm spotting, storm chasing, more developmental sprawl (damage targets), more people, and better documentation with cameras (including cell phones) than ever. Modern averages of roughly 1200 per year nationwide probably are as close to the truth as we’ve ever seen. 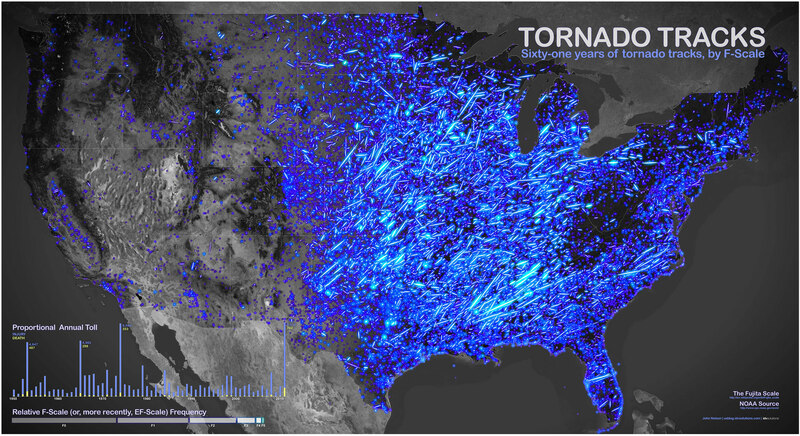 Another few decades of well-documented tornadoes will tell us more. To compare tornado counts before Doppler radars, we have to either adjust historical trends statistically to account for the unreported weak tornadoes of before, or look only at strong to violent (EF2-EF5) tornadoes, whose records are much better documented and more stable. When we do that, very little overall change has occurred since the 1950s. 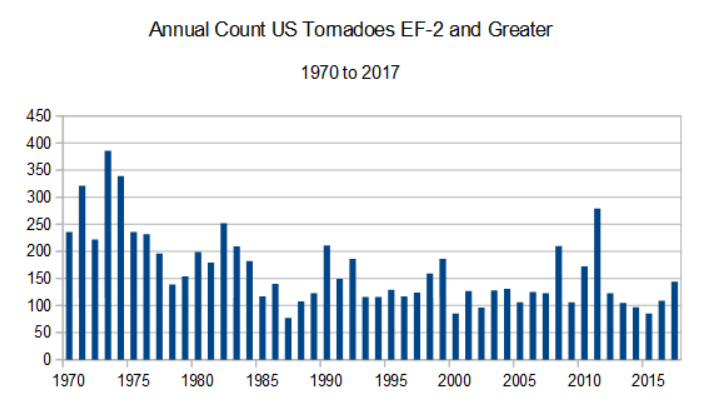 This is in direct contrast to the number of EF-1s, which indicate a broadly flat trend, with record numbers set in 2011 and 2017. 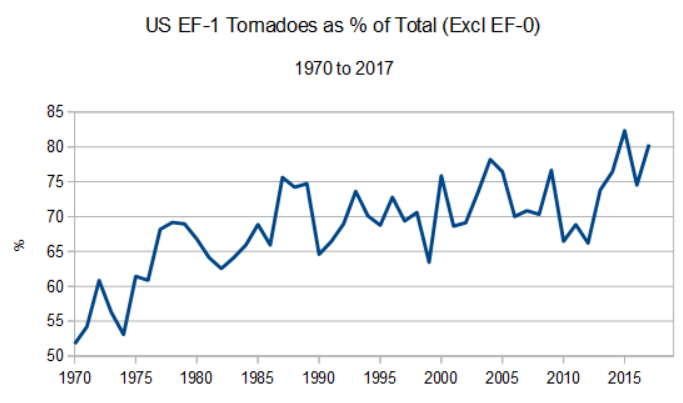 The contrast is even more stark when we examine the proportion of EF-1 tornadoes of the total, which has gone up from the 50%s in the 1970s to the 70%s in recent years. It should be noted that the number of EF-1s dwarf the number of stronger ones – typically 400 pa of EF-1s, compared to about 100 of the rest. Reporting of EF-1s has probably only been consistent since the late 1990s. Prior to that, many EF-1s occurred without actually being reported. Given the preponderance of EF-1s in overall totals, I find it astonishing that the authors of the NOAA 2014 study were allowed to get away with publishing a report using EF-1 data, and claiming that more tornadoes occur now on tornado days. But, just supposing the EF-1 data is correct, the unmistakable conclusion is that, on average, tornadoes are becoming weaker. But I doubt whether you will hear any of this from the Capital Weather Gang. How much longer can this go on with the disaster scenarios and predictions of doom? I have noticed that they like to use “may” and “maybe” and “could” and “could be” and “might” and “possibly”, As soon as I read these words I know that I am not reading science but warmist propaganda. I also notice they are pushing catastrophe further and further into the future which suggests they are worried by all the climate fails there have been and the fact that people might start to notice. Whatever the pundits, politicians, pessimists and rent-seekers may/could/might claim, no one knows. Science does not reliably predict the weather or climate. The only winners so far have been the rent seekers, of all sorts and the main losers we taxpayers. More on fewer days LOL. Talk about desperate spin. I see the Polar Bear fightback has begun with similar logic, rushed out MSM stories – even though there are less bears, people are seeing more bears, because they are being forced into contact with people through diminishing ice (which isn’t even true for recent years). These recycled stories, desperately promulgated by the ‘true believers’ in this absurd ‘dead parrot’ of a theory (CAGW), seem to contain less and less of conceivable interest to the ordinary person. Climate Change is an ideal Equal Opportunity frontier. Where else there is no requirement on the IQ of “experts”? They seem to select them by the most democratic process ever invented – a lottery. Severe and tornadic thunderstorms are spawned by strong temperature and pressure gradients. Warmer planet means lower continental temperature gradients; ergo–fewer strong tornadoes. It’s always “it’s going to happen”, “it’s coming”, “it will get here yet”, “we’re really, really sure it’s coming”. The whole thing is like paying a psychic to predict your future—they can always predict more and more things that “will come” someday. Just you wait. Indeed. They’re making it up as the climate goes along on its merry way, then tring to pretend it’s all known science. Laughable. The following is a little history of the lands on the western edge of the region of tornadoes. I’m reading Timothy Egan’s book about the American Dust Bowl years (before, during, after), “The Worst Hard Time.” Material below is from Egan. In the prior years, settlement was more to the north – think in the direction of Montana – and folks were already clearing out of these places. About the same time, railroads and land developers began a focus on the southern high plains. The big push was from Government, especially setting a high price for wheat, needed on the world stage. In the early part of the century there were very few people in that expanse of land that we know (now) is the western edge of a tornado frequency map. In the late 1920s and early ’30s population increased in the region – think of a large region centered on the panhandle of western Oklahoma. The Great Depression began and commodity prices dropped – wheat, oil, cattle. Then the dry years hit and the “black blizzards” started (Jan., 1932). The rapidly expanding population then reversed, people left, towns died. I realize the dates mentioned are pre-1950s. However, I don’t think it is possible to have an accurate count of tornadoes, even the stronger ones, from a region with major weather, economic, and demographic issues such as existed prior to the end of WWII. Your post covers the period from 1950 to that of NEXRAD Doppler. This is all fine. Putting the issue of record continuity aside as a practical matter I’ll trade an EF4 for a plethora of EF0, and 1s. I have not quite understood why it was decided that the “violent” nomenclature only includes EF4 and 5 tornadoes. EF3s are plenty violent and kill quite a few people. During major outbreaks it is not uncommon for there to be two or more EF3s on the ground at the same time. The same cannot be said for the EF4 and 5 storms. Palm, Sunday 1965 comes to mind. An event where I saw three of them, an EF4 and two EF3s one right after the other come through Kokomo, IN. For some reason accounts these days say there was only one or two. There were three. My 9 y/o eyes saw them. Two following one right after the other along the same track and a third a minute or two later and following a parallel track. The biggest, which they said was an EF4 came first. EF is what they apply now days but back then it was just the F scale. OT but I thought I would mention that apparently Tony Heller’s site is under attack. For two days I have gotten 502, 504, 520, and 524 errors. This started after Scott Adams, creator of the Dilbert cartoon strip, used Tony’s site as a reference to challenge alarmists. Fortunately he seems to be back up. I go to Tony’s site every day, and it all works fine. I got the error RAH did and tried several times within 1/2 hour. Several hours later it came up. Using Win10 and Edge. Same that I’m using. After Scott Adams challenge on Twitter I at first thought it was due to his fans overwhelming the server. Then as it went on longer, the better part of two days, I began to think it was an attack because servers don’t generally get overwhelmed in the wee hours of the morning for two mornings in a row. Widows 10 and Edge that is. Keep in mind that the Washington Post is one of the news outlets, along with CNN and a couple of others which President Trump dubs “fake news” with good reason. They are vying with the BBC for low status.